Signing ceremony between COMAC and Jiaxing held__Commercial Aircraft Corporation of China, Ltd.
A signing ceremony between Commercial Aircraft Corporation of China, Ltd. (COMAC) and Jiaxing Municipal People's Government was held in Jiaxing on November 22nd, 2018. 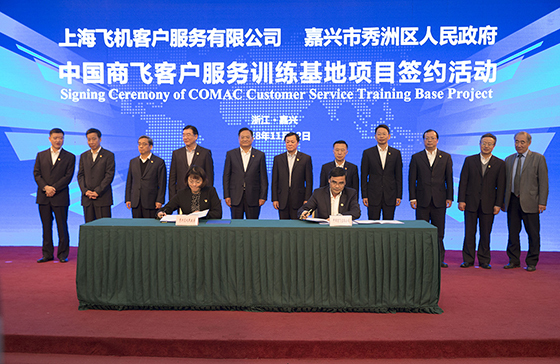 Shanghai Aircraft Customer Service Co., Ltd. of COMAC signed a Framework Agreement on COMAC Customer Service Training Base with Xiuzhou District People's Government of Jiaxing. Shanghai SAIFEI Aviation EWIS Manufacturing Co., Ltd. signed a MOU on Strategic Cooperation of SAIFEI Aviation EWIS Project with Xiuzhou National Hi-tech Industrial Development Zone. Mr. He Dongfeng, Secretary of the Party Committee and Chairman of COMAC, Mr. Zhang Bing, Secretary of the CPC Jiaxing Municipal Committee, Mr. Zhao Jiufang, Mr. Cheng Fubo, Mr. Zhou Xinmin and Mr. Zhou Qimin, Members of Standing Committee of the Party Committee of COMAC, attended the signing ceremony. Mr. 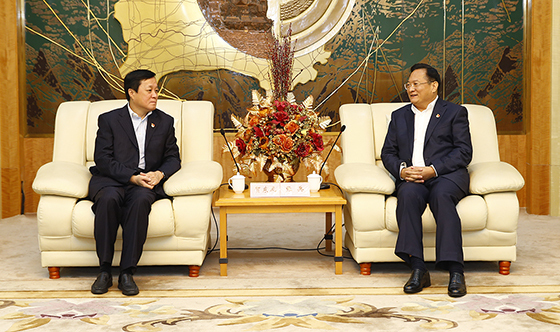 He Dongfeng expressed that Jiaxing had been the birthplace of the Chinese Communist Party (CPC) and played an important role in the development history of the Party and the integrative development of the Yangtze River Delta region. COMAC had undertaken the mission of letting China-made large aircraft fly in the blue sky. He hoped that both sides could further implement the spirits of major instructions of General Secretary Xi Jinping on trunk liner career, strengthen regional cooperation and cooperation on major industrial projects, accelerate advancement, accelerate construction, build as soon as possible, use as early as possible, and jointly promote the development of China's civil aviation industry. Mr. Zhang Bing expressed the hope of giving full play to the advantages of Jiaxing in location, industry, system and market and the advantages of COMAC in civil aviation R&D, manufacturing, technology and talents in order to promote the project to be started, finished and used early, and promote the better and faster development of the trunk liner career of China. The COMAC Customer Service Training Base Project is located in Xiuzhou National Hi-Tech Industrial Development Zone, with a planned land area of 200 mu, and is mainly to build a COMAC Customer Service Training Base which includes a domestic civil aircraft training area, a COMAC University teaching area and a living supporting area. The SAIFEI Aviation EWIS Project is located in Xiuzhou National Hi-Tech Industrial Development Zone, with a planned land area of 80 mu, and is mainly to provide aviation EWIS for C919 and other programs.